Do you remember the first time you wirelessly surfed the web from a laptop? What about when you first watched a movie on a wirelessly connected TV? More such a-ha moments are coming. Perhaps one day you’ll fondly recall the first time you streamed “Star Wars: Episode 9” from your overhead lights. The wireless gods have been hard at work on your home network. You can already eliminate dead spots, for a price, by placing wireless access points all over. But some problems can’t be solved by Wi-Fi’s evolution alone. Three leaps forward could be key to building a fast and evenly distributed home network, streaming ultra high-resolution video—think live virtual-reality TV—and handling that ever growing number of “smart” devices. Much has been made of the power of mesh Wi-Fi to eliminate dead spots and increase performance. The principle is simple: Instead of just a single router bristling with antennas, why not have a little one on every floor or in every room, all passing bits, like a bucket brigade, to the farthest reaches of your domicile? The little routers don’t even have to be very smart, since most of them—from Google, Eero, Plume and others—talk to the cloud in order to optimize the network. The problem is that people might not want to buy boxes—seriously, six-packs—of routers for their home. One alternative is to rent through your cable company: Comcast has announced a deal with Plume to eventually offer the system to its customers. Eero Chief Executive Nick Weaver says his company has its own partnerships in the works, though he isn’t ready to announce them yet. But why install network extenders at all? What if every Wi-Fi-equipped device in your home could provide bandwidth as easily as using it? Why couldn’t your connected speaker or smart TV serve as a network node? Plume is working with wireless chip designers to enable this, says CEO Fahri Diner. Eventually, your network could grow stronger as you add more devices to it. And because of standards and smart-home tech from Apple, Samsung , Amazon and others, connecting them may be seamless. Imagine downloading an entire movie in seconds. Or streaming games and 4K videos from your phone to your TV without dropping a frame. Or even wandering around the living room in a VR headset, unencumbered by a tether to some giant PC. This is the promise of WiGig. It’s sometimes described as the next generation of Wi-Fi, but that isn’t accurate. Until now, each new variant of Wi-Fi improved upon the last, but this one, known to nerds as 802.11ad, has a special purpose. WiGig technology is capable of sending and receiving data at up to 8 gigabits a second—almost six times as much as the current peak. But in order to achieve superhigh transfer rates, it operates at 60Ghz, far higher in frequency than the 2.4GHz and 5GHz bands that we normally access. The trouble is, 60Ghz radio waves can’t penetrate most walls, says Ronald Glibbery, CEO of Peraso Technologies, which makes chips that power WiGig systems. 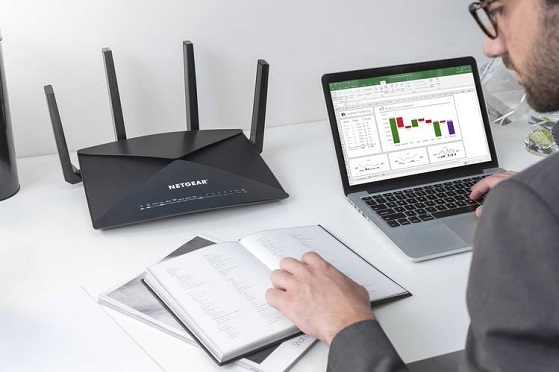 The Nighthawk X10 Smart WiFi router is one of a handful of products that already support WiGig technology and its superhigh data transfer rates. In June, Intel and HTC demonstrated a wireless VR system they argue could be WiGig’s killer app. Anyone who has tried whole-room VR knows it’s annoying to have a cable snaking out the back of your head. And in environments where Wi-Fi spectrum is already impossibly crowded, such as airports or convention centers, WiGig could enable “cones” of high-speed connectivity. A handful of products already support WiGig, including $350-and-up Wi-Fi routers from Netgear and TP-Link, and a $1,000 laptop from Acer. Will higher-frequency microwaves be a health hazard? The Federal Communications Commission sets rules, based in part on recommendations from nonprofits such as the National Council on Radiation Protection and Measurements, in an attempt to ensure that doesn’t happen. Transmitting information with light is as old as the signal fire, but transmitting high-speed data via the lights above our heads has only been possible for about five years. A handful of startups—including VLNComm, Velmenni and PureLiFi—are working on systems that flicker LED lights so quickly they can transmit information at up to 43 megabits a second. The flashing of these lights is beyond human perception, tens of millions of times per second, far faster than any annoying fluorescent bulb. As the light flickers, a sensor attached to a laptop, TV, tablet or phone picks it up and turns it back into data, like a telegraph worker translating Morse code. A LiFi receiving dongle plugs into a tablet or other device, and a sensor picks up flickering light and turns it into data. Shown, a pureLifi Ltd. dongle on the opening day of the Mobile World Congress in Barcelona, Spain, in February 2017. While current “LiFi” is actually slower than conventional Wi-Fi, in theory it’s possible to transmit a thousand times as much information via light. Just look at trans-Atlantic fiber-optic cables. But the challenges of making LiFi work are considerable. For one thing, there has to be a line of sight between transmitter and receiver. The upside is that putting more LiFi lights into a building won’t lead to interference, like conventional Wi-Fi. Alistair Banham, PureLiFi’s CEO, says most applications in its pilot program tend to be in places where security is paramount or conventional Wi-Fi is a nuisance, like hospitals. Meanwhile, traditional Wi-Fi isn’t standing still. Qualcomm and other industry heavyweights are working on 802.11ax, which should make the existing spectrum more efficient. One day, we may beam exabytes at each other using gamma rays. (Hopefully lead jumpsuits will be in fashion by then.) In the meantime, we’ll have to settle for wireless standards that are ever faster but, owing to inescapable laws of physics, come with new quirks to adapt to.